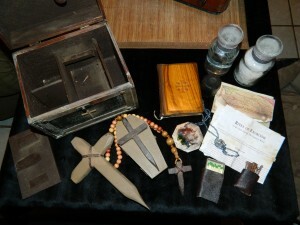 CRYSTOBAL has some new Vampire Killing Kit items for sale in the Etsy Vampire Killing Kit Shop. These include several cross-stakes that are wall mountable, coffin-shaped jewelry boxes, and a new, small Vampire Killing Kit. Something new from CRYSTOBAL’s workshop – A vintage style oval wooden wall hanging with detachable wooden cross stake. 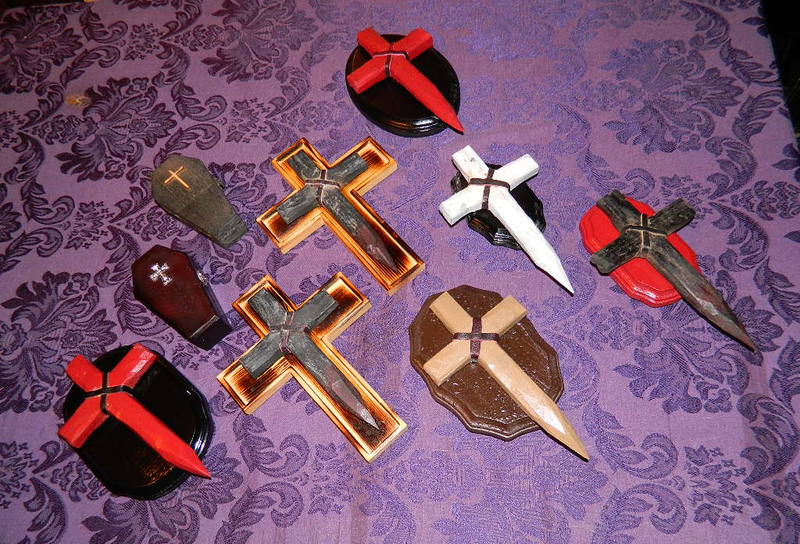 Cross stake is bright, deep red lacquer with trademark leather X binding, hand-sharpened for staking vamps. Hooks onto the black lacquer wooden mount, which hangs on the wall. Beautiful black and red motif adds goth decor to any room, plus you have the added value of having a vampire killing tool close at hand for any given emergency. There are currently four different types for sale, including a rare white cross and a one of a kind cocoa-colored cross on a brown placard. All cross-stakes are hand carved/sharpened by CRYSTOBAL and are bound by his trademark leather “X” binding. As with most of his works for sale online, these are lightweight, intended as stage props or home decor, and are not recommended as weapons against real vampires. CRYSTOBAL has created two small coffin-shaped boxes, hand-antiqued and ready for you to use for jewelry, curios, or fresh garlic. The two boxes are different styles, and both compliment CRYSTOBAL’s other works and vampire killing kits for sale. 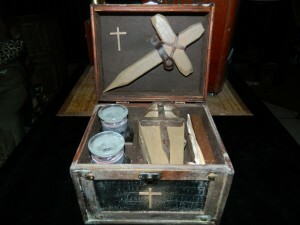 This is a turn-of-the-century style primitive, hand-made replica Vampire Killing Kit for sale by CRYSTOBAL. This medium sized kit (6x6x7.5″) packs a big punch! Created with a European style in mind, this original Vampire Killing Kit contains all the essentials in a vintage-style carry box. It is very unique for a CRYSTOBAL kit by which he has deviated from his usual “black” style and has crafted this kit using browns and beiges, harkening to a more Victorian era style. 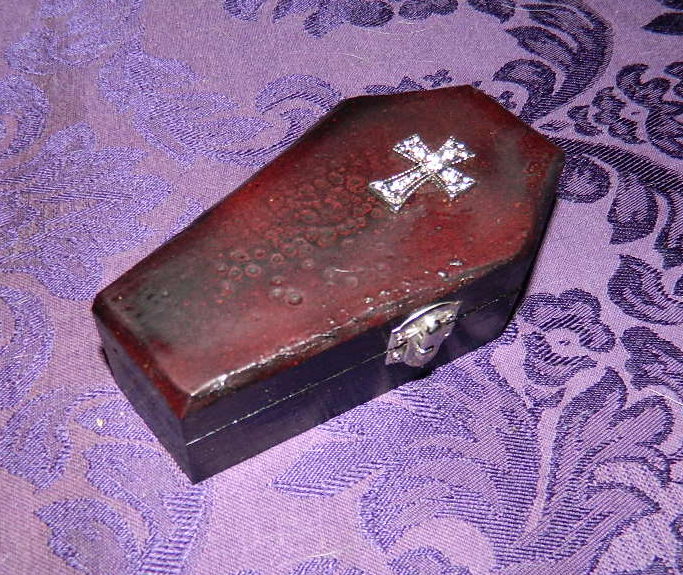 1 carrying case, wood and faux leather, adorned with crosses and coffin nails and hand-antiqued to show a century of use. For more information or to view Vampire Killing Kits for Sale, visit our Etsy shop online.